Club Penguin Cheats by Mimo777 Club Penguin Cheats by Mimo777: April Party Announcement! April is almost here and do you know what's coming up on Club Penguin!? I do! 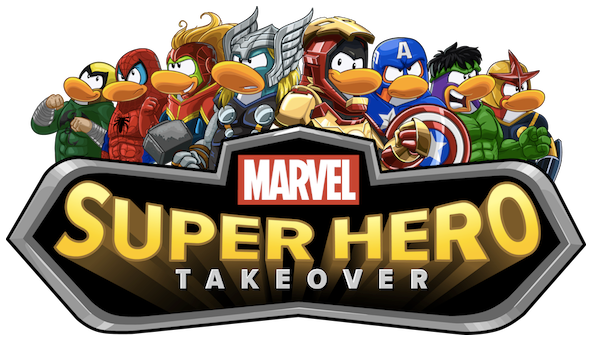 It's the return of the Marvel Superhero Takeover coming April 24th! Whaaa!? Yeah! There are many secrets coming with this party, so they won't spoil the surprise (they probably will). But this will be almost an ENTIRELY NEW PARTY! New heroes, villains, and places from the Marvel Universe! Why aren't they having an April Fools Party this year? Marvel, DC Comics, Marvel DC Comics, ect. ect. and so on. i dont want to miss it!i was on a trip last time so no internet and i was so mad when the party ended because i never got to go to it. It's an april fools joke guys. It's actually an April Fools party. PH is on the roof in Abominable. Took a screen shot already. Sooooo many places to blow things up and shoot them, why do we have to be one of them? Yeah. I would LOVE an April Fools Party this year. Because we love all the mascots and we want Rookie! Who's going to be the mascot for this party?!?! I'd love to have one and call it skittles! I feel like we just had this party. Maybe this is just an April fool's joke, and we really will have an April Fool's party instead! Iron Man has a new armor it seems. Guys, they're already having a new mission party and superhero party this month. They can't do 3 in one month.